This is such a beautiful book! 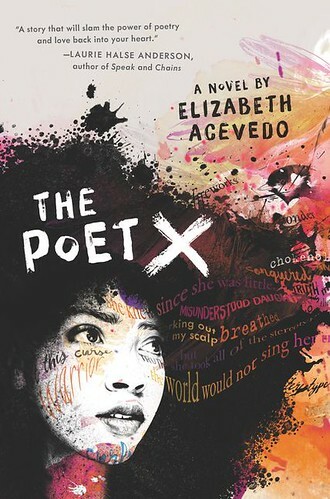 Elizabeth Acevedo has written a teen love story, a story about finding your place in the world, and a story about how to stand up to your family and a society that only sees one thing when looking at you. And she has written it as poetry. It really works. I had my doubts, but I quickly lost myself in the book, realising that you don’t need all those words found in other novels. It’s perfectly doable to describe a complex story about a teenager in Harlem this way. X (Xiomara, really) likes poetry and writes a lot of it herself, keeping it to herself as well. She needs it to make sense of the world. X’s mother is hard on her, but as an adult I could see that she loves her daughter. She just doesn’t trust anyone, and wants X to be careful and pious, not to see boys, and to go to church. Were it not for the poems and the beauty of this book, it’d be just another teen story, set in New York, featuring girlfriends and boyfriends and enemies and bullying at school, teachers, neighbours, the priest, and so on. I’m not a great fan of poetry, so the fact that I loved this so much, is proof how well the concept works, and what a captivating story Xiomara has to tell. I’m not at all surprised the book has been nominated for the Carnegie medal, and I hope it goes a long way, maybe even to the top. I was also pleased to see that Elizabeth incorporated a lot of Xiomara’s Spanish home language, without always translating every word or line. There is even a whole poem in Spanish, although that does get a translation on the next page. So very lovely, in so many ways.